More than 600 suspected Taliban fighters have been killed over the past month, the bloodiest period in southern Afghanistan since their regime was overthrown five years ago, US officials said yesterday. PASHMUL, Afghanistan, Sept. 3, 2006 Warplanes and artillery pounded Taliban fighters hiding in orchards Sunday during a big Afghan-NATO offensive that the alliance said killed more than 200 militants in its first two days. Four Canadian soldiers also were killed. If the estimate is confirmed, the battle would be one of the deadliest since U.S.-led forces ousted the Taliban regime five years ago. Police attacked a group of Taliban late Friday who were planning to strike security forces in the central Afghan province of Ghazni, killing 18 and arresting six others, said provincial police Gen. Ali Shah Ahmadai. southern Helmand province on Friday, a combined police and U.S.-led coalition patrol came under attack with mortar, rocket-propelled grenade and small-arms fire. In the fight that ensued, "almost two dozen" insurgents were killed, the coalition said in a statement Saturday. U.S.-led troops and Afghan security forces also raided compounds late Friday in three villages in the remote Pitigal Valley border region, where intelligence showed that top militant leaders take refuge as they travel between Pakistan and Afghanistan. More than 20 insurgents were killed and 11 others were detained, while officers also discovered a bomb-making factory, the U.S.-led coalition said in a statement. 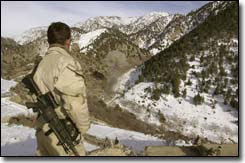 Colition forces are experiencing an unparalleled success it tracking, finding and killing Taliban. Our Paradigm Intel indicates the Taliban has been penetrated at the highest levels. This mop up started in July. From David Tate, at "the Fourth Rail"
The US troops, augmented by the Afghan National Army and close air support, are targeting "hundreds of foreign fighters" who are well-entrenched. The showdown has been brewing since February when fragmented militant groups reorganized under the name "Tora Bora Mahaz (Front)." The group is led by Unus Khan, eldest son of the famous mujahadeen leader from the Soviet-occupation, Anvarul Hak Mujahid. The Taliban forces, backed by al Qaeda, began to reoccupy the extensive underground complex that saw heavy fighting during the opening months of the war. By late May, the Taliban had declared the opening of the "Tora Bora front." 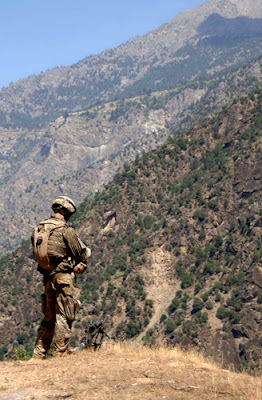 The group's first declared attack on Coalition forces came in March when a Marine Special Forces unit was targeted by a complex ambush outside of Jalalabad. The Marines returned fire, killing up to a dozen civilians. The incident precipitated the newly commissioned unit's early departure from the country. Countering the move, in preparation for the current operation, paratroopers and engineers from the 173rd Airborne Brigade Combat Team began work on Forward Operating Base Lonestar in Par Wa Agam district in early July. The new FOB, 20 kilometers from the border, overlooks the foothills of the Tora Bora Mountains, where Taliban and al Qaeda operatives are known to cross over from Pakistan. Incidents in Afghanistan by province from Jan. 1 to August 12. Click to view. Nangarhar province is one of the most dangerous in Afghanistan. According to data compiled by Vigilant Strategic Services Afghanistan, there were 620 security incidents reported in the province from January 1 through August 12, making Nangarhar second only to Kandahar, with 774 security incidents. Kunar finished third with 613 security incidents over the same time period. Nangarhar borders Kunar province to the north, which has been the scene of major battles between the Taliban and US and Afghan forces over the past year. Nangarhar also borders the Pakistani tribal districts of Kurram and Khyber to the south, and Bajaur to the east. The TNSM openly run Bajaur province after the Pakistani government negotiated a peace deal in March, while the Taliban maintain a strong influence in Kurram and Khyber..
Iran, USA has something for JUST you. oK CHECK THE SKY, "ALL CLEAR"
Safe house 1,400 feet away, made it HOME IN 45 SECONDS. Run into house laughing, congrads all around. Everyone DEAD, SAFE HOUSE BOMBED. Look at what al Qeda is. Just a bunch of criminalized terrorists, no different than any other terrorists. Except they latched on to the WWW and have a good understanding of "VIRTUAL" Groups. They can make a hand full of warped jahidists look like an Army. And they pay bountys for Attack videos, huge sums. Seems someone is moving to take out AQ and Taliban's Command and Control, killing every terrorist web site in sight. It also seems many of the terrorist webmasters have met with death, and not a martyr. Rusty of mypetjawa has a nice piece on it. I'm still looking for the Bounty on the heads of the terrorist webmasters. We will welcome the money, maybe retroactive? BAGHDAD: An al-Qaida front group maintained Thursday on an Islamic Web site known to be used by extremists that it had killed an employee of the U.S. Embassy in Baghdad, but the Embassy cast doubts on the claim's validity. On the site, the Islamic State of Iraq claimed the execution of an embassy "official" it identified as Zaher Abdel Mohsin Abdel-Saheb took place Saturday as revenge for "the Muslim women who are still captives in the prisons of Shiites and crusaders." The Arabic-language statement was signed by the Ministry of Information of the Islamic State of Iraq. The veracity of the claim could not be independently verified and the U.S. Embassy said it was "checking records." "However, at this time it appears there is no record for a person by the name of Zaher Abdel Mohsin Abdel-Saheb who worked — or ever has worked — at the U.S. Embassy in Baghdad," the Embassy told The AP in an e-mailed statement. IN THE NAME OF ALLAH THEY HAVE KILLED THE WRONG MAN. Hmm double production of drugs should lead to halving the price, supply/demand. A Saudi journalist and expert on Islamic movements and Islamic fundamentalism as well as Saudi affairs. Mshari is Asharq Al-Awsat's opinion page Editor, where he also contributes a weekly column. Has worked for the local Saudi press occupying several posts at Al -Madina newspaper amongst others. He has been a guest on numerous news and current affairs programs as an expert on Islamic extremism. 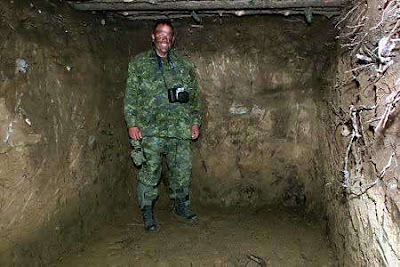 The latest news on 'Sheikh' Osama Bin Laden is that he is currently seeking refuge in a huge white cave in the Tora Bora Mountains. 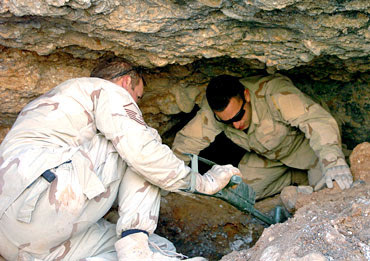 The cave is said to be connected to a series of caves and protected by some armored cars and a group of ever-loyal suicide bombers. Last June the Saudi daily 'Al-Watan' stated that US intelligence detected "al Qaeda messages sent during the night urging Afghans to fight against the foreign forces." Meanwhile, investigations on the 'Tora Bora front' led to the arrest of Bin Laden's doctor and another person whose task was to protect him. Both of them confessed that they were a part of the 500-member al Qaeda organization which had fled Waziristan to the Tora Bora region. Tora Bora and Waziristan; the first is Afghan territory while the latter is Pakistani. However, they are neighbors that share the same borders. The two cities are inhabited by the Pashto tribes, which are extremely rigid and volatile, in addition to the prevalent tribal culture that is not governed by the state and in which powerful tribesmen exhibit their clout, impose levies and recruit new combatants. The Tora Bora region lies south of Waziristan by approximately 1,500 kilometers. These two locations have witnessed the movements of al Qaeda leader, Osama Bin Laden and his followers since the American war on Afghanistan. Today, Tora Bora has reemerged onto the scene following the story about the big white cave. BIG HAT TIP TO RUSTY OVER AT OUR FAVORITE BLOG MY PETJAWA. A terrorist organization in Iraq, the Jaish al-Mujahideen, has criticized an al Qaeda front group, The Islamic State of Iraq, for stealing their video. No joke. The recent al Furqan video shows what is claimed to be an al Qaeda IED attack on a police vehicle in Fallujah. But the video appears to be the same as an earlier attack claimed by Jaish al-Mujahideen. "Most likely explanation? IED freelancers are videotaping their attacks and then selling them to the top bidder who then throw a watermark on it and then distribute via the internet." We were confused as how they could be so productive video wise. We couldn't track the motivation, context didn't fit. There is a pay scale for videos, bigger target, more bodies higher pay. And some greedy insurgent wana bee ( free lancers ) sold the video to both...ha ha . And they got caught, motivation financial reward. some rubes maybe still submitting their videos and not getting paid. So some attacks may be launched just for the video reward. Which means it is substantial, and many of the IED attacks are not political or religiously motivated. Mullah Berader, a top Taliban commander, was killed early this morning in a U.S. air strike in volatile Helmand province, a senior Afghan general tells ABC News. A convoy of British troops and Afghan National Army (ANA) soldiers was traveling through Salwan Qala district when they came under attack by Taliban forces, said Gen. Ghulam Mohiauddin Ghoori, the commander of ANA ground troops for Helmand. 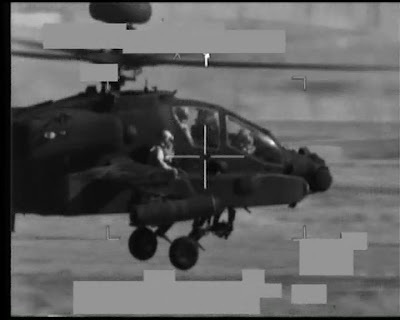 Amid an intense firefight, the British troops called in air support. American warplanes struck the Taliban positions, causing dozens of casualties, said Gen. Ghoori. Among the dead, his men on the ground confirmed, was Mullah Berader. In Kabul, the Defense Ministry also confirmed the report, saying Berader was killed in a pre-dawn raid. Berader, also known colloquially as Mullah Brother, was close to Taliban leader Mullah Omar. His death will come as a major blow to the Taliban hierarchy and follows the deaths of senior commander Mullah Dadullah Lang in May and the arrest of Defense Minister Mullah Obaidullah in Quetta, Pakistan in March. Many believed Berader succeeded Obaidullah as defense minister, though his exact rank was in dispute. OUR ESTIMATE IS HE WAS IN THE PROCESS OF TRYING TO PULL PRESSURE OFF TORA BORA, Malawa valley AREA WITH NEW ATTACKS ELSE WHERE. The item calls on every Muslim to regard jihad as a personal duty and to take initiative to establish a jihad cell without waiting for recognition from Al-Qaeda. DON'T WORRY ABOUT THE SECURITY FORCES. It goes on to elaborate on how to form and run the cell, how to raise funds, and how to select a target, "for example, assassinating the American ambassador," which, it states, "takes no more than a gun and a bullet." REMEMBER TO SAY BYE TO YOUR FAMILY, LIFE AND FUTURE. "Do you really have to meet Osama bin Laden in person in order to become a jihad fighter? Do you have to be recognized by Al-Qaeda as one of its members to become a jihad fighter? If Al-Qaeda commanders should be killed, would the jihad be eliminated? What would you do if Al-Qaeda did not exist today? THE WORLD WOULD NOT HAVE ALL THESE SMALL WARS, AMERICA WOULD STILL BE IN usa NOT IN THE ME. How is Osama bin Laden different from you? YOU CANNOT JOIN AL QEADA, THEY WANT YOUR HELP BUT DON'T WANT TO ASSOCIATE WITH YOU. – [yet] he managed to establish the world jihad organization. Who provided training to Osama bin Laden and Abdallah 'Azzam when they went to Afghanistan to become the first Arab jihad fighters? HIS ACTIONS COST TWO MIDDLE EASTERN COUNTRIES, CAN YOU SCREW UP THAT BAD? THEY ARE AFRAID OF CONTACT, THEY SIT HIDDEN SAFE. MAYBE SPEND YOU LIFE IN THE STUDY OF THE KORAN AND WORKING TOWARDS SOLUTIONS, HELPING THE UMMAH? YES THEY ARE EASILY INFLUENCED AND TALK MUCH THEY MAY NEED THE REWARD FOR TURNING YOU IN. YES THE NEW LEADER IS THE NEW IMAN FOLLOW HIM BLINDLY, AND YOUR SHURA COUNCIL MUST BE COMPOSED OF RADICALS OR THEY WILL ADVISE YOU AGAINST THIS. YES YOU CAN FORCE MONEY OUT OF YOUR MEMBERS, REMEMBER THE LEADER IS THE NEW BOSS. Then you should buy weapons, make plans, brainstorm, plot your plans, monitor your enemy's important objectives, and study its moves. YES NOBODY WILL NOTICE YOU DOING THESE THINGS, WILL THEY. Set a goal; for example, assassinating the American ambassador – is it so difficult? THERE ARE REWARDS FOR ANYONE TURNING IN THIS PLAN, AS SOON AS IT IS MADE THE REWARD IS AVAIABLE. Is it [indeed] difficult for someone who has already crushed America in his home? YEARS OF TRAINING, MEETINGS WITH BIN LADEN, EXPERTS TO ASSIST HIM, AND HUNDREDS OF THOUSANDS OF DOLLARS, OF COURSE YOU NEED NONE OF THIS. who planned an action which even today shakes the world every time it is mentioned? YES REMEMBER THE LONDON DOCTORS, THE BOMBINGS WHERE THEY ONLY BURNED THEMSELVES. YOU ALSO NEED NO HELP OR AT LEAST WON'T GET IT FROM aq. YES JUST FPOLLOW HIM AROUND FOR day OR WEEK, IT SHOULD BE EASY. I GUESS THEY MEAN TO MEET IN THE MOSQUES. OK MEETINGS ONCE A WEEK AND ONCE A MONTH, NEVER IN THE SAME PLACE. FOLLOWING AROUND THE AMBASSADOR, THE LEADER NEED NOT DO THIS AS IT IS TOO DANGEROUS. THE MEMBERS WILL GIVE YOU MONEY TO LIVE SO YOU CAN PLAN THIS, YOU MAYBE ABLE TO STRETCH OUT FOR YEARS, YOU DON'T HAVE TO WORK. recruit [new members], and assist in [actual operations]. Those who act in the open must perform the primary military operations, such as assassinations, firing at enemy facilities, etc. OF COURSE AS THE LEADER YOU ARE NOT ACTING IN THE OPEN, TOO RISKY. AL qAEDA NEEDS CANNON FODDER. THEY ARE CLOSING GITMO, SO YOU WON'T BE GOING THERE AT LEAST. "paltalk" target of Jahidists, fake petition. We the following feel shocked and appauled that such a commodity as Paltalk is being used by certain elements and parties to harvest hate against ethenic minorities, in particualar against the Islamic faith. To us this is racist and unacceptable and a sickness that should not be tolerated for long. 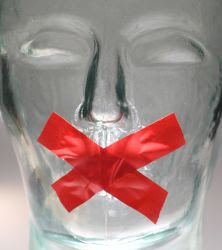 Racial terminoligy and profanity have been used in G-rated rooms by certain parties who shall rename nameless unless their nomenclature is required. A suffering to which children have been subjected and their young minds wrongly manipulated to feel hate towards certain elements. We feel it is your responsibility to put an end to this. Hence we ask of you to correct such wrongs before the hate consumes more people and causes more pain for some. Racism is something that the better part of the world condemns and doesnt allow. We, the undersigned hope that we can soon count Paltalk, a community of four million that stretches across the globe among that better part. SO YOU CAN SUBMIT FAKE SIGs. This advise make the petition null and void, worthless. USA army troops denied non-leathal weapon. USA Troops die, because Col. wants to be politically correct. Does Col. Kirk Hymes, need to be moved, promoted out of the way, to Iraq, front lines, then see what he says. If that is what stopping the weapon from being deployed then that that decision maker should be sent to Iraq for a personal view of the situation. But they miss the MAIN point. A cyber war will evolve around bots. USA has a major paradigm error incorporated into its defense. Current the defense strategy is to count active bots only. The best enemy strategy is to build 50 thousand bots a day and test 5,000 of them, then shut them off, waiting for attack orders, no one knows how many sleeping zombies are out there. Of course many countries will be using/sharing even the same zombie computers without even knowing it. There are just so many computers to infect, so there will be multiple infections on the same computers. If we are lucky multiple bot herders trying to control the same zombies may shut many of them down. Phones will be down as the world had integrated the www onto the phone system, cell phones to. TV many communications systems down, TV gone, CABLE. and many FM stations crippled also as most rely on the www. It will result in a world wide recession. 90% of the world will get "cannot access server" for weeks even months and not years if we are lucky. The remaining 10% will be very very slow, as the worlds 90% try to climb on to use the 10% thats not down. The only thing that will bring the www back up will be for each attacking country to voluntarily , stop attacking or for USA to take out the zombie computers, which will only work if they are already controlled before the attack, if they can get instructions thru to the bot zombies over the crippled internet. There is the possibility once the attack starts it cannot be stopped, and the "stop" command can not get through the Internet because its down. An offensive option in bot warfare only makes the condition worse, adding more bots to a dos attacks just takes down more of the net. WE think this is the most accurate look at the CYBER WAR PARADIGM. And much of this is not even considered by the Pentagon. Even though the headline below is true, they are not considering an accurate Paradigm. Can the Zombie threat be removed? Can the Zombies be killed? Can USA find them before a cyber war. The "Emergency Broadcast System" is tied into the WWW. ITS NOT IF BUT WHEN. 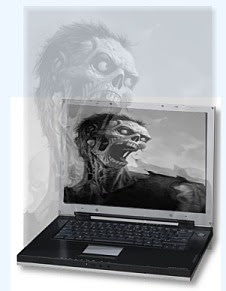 Bright side, as people get tired of the "cannot find server" they will turn their computers off, when every one has turned off thier computer all attacks will have stopped as they will have also turned off the zombie computers. Then we have next round, round 2 of the cyberwar as bots are activated again. Patkistan: moving, "the past into the Future"
By Kevin Poulsen August 29, 2007 | 3:02:57 PMCategories: Cybarmageddon! Politicos in California's rural Central Valley are lobbying to bring the Air Force's elite Cyber Command to nearby Beale Air Force Base, where it will boost the local economy with its environmentally-friendly form of war. The 25,000-person Cyber Command is currently headquartered at Barksdale AFB in Louisiana, but it's looking for a new home. 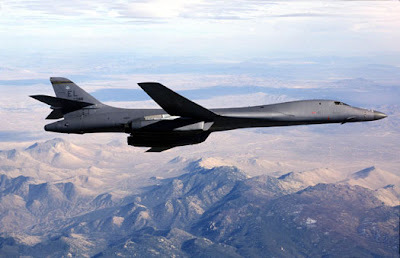 Candidates include Offutt AFB, near Omaha, Nebraska, and Lackland AFB outside San Antonio, Texas. John Nicoletti, Yuba County supervisor, said Beale's pitch is especially attractive because the Cyber Command won't create pollution on the scale of more traditional military operations. "This is a green industry," Nicoletti said. "We're not talking about airplanes and solvents." This is, of course, appalling. A quick check of the cyberwar doomsday map reveals that Beale AFB is just 140 miles northeast of THREAT LEVEL headquarters in San Francisco. In other words, California managed to navigate the entire cold war without hosting a single nuclear missile silo on its fertile soil, and now Yuba wants to position Cyber Ground Zero upwind from the second most populous city on the west coast. Sami Saydjari, executive director of the nonprofit Cyber Defense Agency said the Cyber Command is being created to protect U.S. government and business networks from the type of attack Estonia suffered earlier this year. Over three weeks, an onslaught of "denial-of-service" messages -- originating from Russian computers -- crippled electronic networks used by the Estonian government, banking industry and media. Saydjari said a successful attack against the United States could cause devastation on the scale of Hurricane Katrina. That means over 1,600 dead, thousands more displaced and homeless. Take it from a "nonprofit" Wisconsin computer security consultancy whose corporate logo is crafted to look like a U.S. military seal. Terrorist using "Cop shows" for training? BAGHDAD, Iraq - U.S. troops released seven Iranians early Wednesday, hours after detaining them at a central Baghdad hotel, an Iranian embassy official said. The arrest of Iranians officials could add to tensions between Washington and Tehran already strained by the detention of each other's citizens as well as U.S. accusations of Iranian involvement in Iraq's violence and alleged Iranian efforts to develop nuclear bombs. On Tuesday, President Bush lashed out at Iran for meddling in Iraq's affairs and fomenting instability in its neighbor. Bush made his remarks in a speech to the American Legion convention in Reno, Nevada, in which he presented a ringing defense of the unpopular Iraq war effort. After being caught trying to smuggle drugs into Australia the Pong Su was sunk by two 2000-pound (900 kg) laser-guided bombs dropped from an RAAF F-111 aircraft. The deliberate destruction of the freighter was said to deliver a strong message to international drug smuggling rings that the Australian Federal Government would take all measures necessary to stop illegal drug importation. across from Tora Bora. USA op stationed here. that is the guidance we've had,"
NO reports from the Taliban. NO videos from the Taliban. Dr. Amin al Haq, who serves as Osama bin Laden's security coordinator, was reported to have been wounded in the fighting, The Telegraph's Tom Coghlan reported from Tora Bora. Al Haq is said to have fled across the border into Pakistan's Kurram agency. As bin Laden's security coordinator, al Haq commands the elite Black Guard, the fanatical praetorian bodyguards devoted to the security of al Qaeda's leader. THE LEADER OF THE "Black Guard". He was wounded early in the op, before all the back doors were closed. He was sent out for medical treatment at a hospital. His forces the Black Guard did not leave with him. Terrorist media arm has released no videos, that signals it is closed up tight. No terrorist media reports, its bad for them. No escape. Who or what ever is there is trapped. Very simmilar to some operations against the Japs in WWII. NOTE WE ARE REPORTING OSINT ONLY. EXPECT a press release soon. The "Tora Bora Front", as Taliban propaganda calls it, borders the province of Nangahar and has been active for about three weeks. 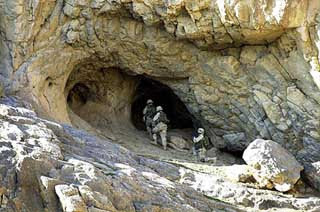 The complex of deep caves, which proved impervious to US bombing in 2001, sits on an infiltration route from the Spin Ghar mountains between Nangahar province and Pakistan's lawless Tribal Areas, where bin Laden is still thought to be hiding. Western officials and local government authorities confirm that Taliban insurgents backed by al-Qa'eda have reoccupied the complex. They believe that one of the group's leaders could be Amin ul-Haq, a close associate of bin Laden. One western official also named Maulvi Anwar ul-Haq Mujahed as a commander of the group. He is the son of Younis Khalis, one of the most famous Islamist leaders in the Afghan jihad against the Soviets. Initial estimates of the Tora Bora force by local Afghan officials put the number at between 200 and 250, including Arab, Chechen and Pakistani fighters. "They have reoccupied the old base," said Haji Zalmai, the district governor of Khogiani, which borders the Spin Ghar mountains at Tora Bora. Khogiani district is a dusty plain dominated by the imposing rampart of peaks that make up the Spin Ghar mountains and the border with Pakistan. Governor Zalmai survived an assassination attempt two weeks ago that blew up his car and the district, which has never been secure, has experienced a recent rise in insurgent activity. The area, which is also notorious for poppy production and smuggling, has had three governors in a year. Zalmai's predecessor was killed and the governor before him was injured and swiftly left the post. A Taliban propaganda blitz across southern Nangahar has led to "night letters" being dropped in villages boasting of the new front. They warn Afghans of the dire repercussions for supporting the government or western forces. Officials in Kabul believe that the move is part of a more general strategic shift in the focus of Taliban operations away from their previous epicentre in the southern provinces of Kandahar and Helmand, where a series of offensives by British troops supported by US and other Nato forces has left the Taliban with a battered command structure and weakening morale. The death of the notorious Mullah Dadullah Akhund in May was only the most high-profile success of a little-publicised campaign, largely conducted by both British and American Special Forces, to decapitate the leadership of the Taliban in the south. There also appears to be a shift in tactics, with the insurgents turning more to terrorist tactics such as yesterday's suicide bombing in Kabul..
KABUL -- Five Western soldiers, including three Americans, were killed in a string of Taliban attacks in eastern and southern Afghanistan, officials said on Monday. This is 400 or 500 miles from Tora Bora, and appears to be an attempt to draw resources off the pressure in Malawa valley region. Japs shoot N Korean spy Trawler, returned fire.. Here's video footage of the Japanese Coast Guard tracking and engaging a north korean spy trawler. The events occur over several hours of daylight and night. It looks like the NK spy trawler refused to be boarded after warning shots with a minigun, it was set afire, stayed afloat, rammed, then the NK's shot at the JCG with automatic rifle fire and RPG(s). Then the Japanese crews really opened up on them and the spy trawler was set afire again and exploded. The last few seconds show the damage to the JCG vessel(s). Please add details if you can read Japanese and if you can find an English transcript about the fight. The CIA is to launch a social networking site to allow members of the intelligence community around the world to converse and swap ideas and information online. The A-Space site, set up by the US Director of National Intelligence (DNI), will go live in December. "This is very typical within the intelligence community of the approach to social networking tools," Mike Wertheimer, the senior DNI official for analytic transformation and technology, wrote in his blog. "We are willing to experiment in ways that we have never experimented before. It breaks a lot of traditional sense that people's lives are at risk, and how can you take any step that increases that risk?" The site will have web-based email and a predictive program that matches interests to information. A-Space will be open only to US agents initially, but the DNI hopes to include agents from other countries as long as they share, rather than just take, information. "Earlier this year, the CIA used Facebook to advertise employment opportunities with the agency," George Little, a CIA spokesman, told the Financial Times. "This effort, part of a much broader campaign leveraging traditional and new advertising media, was used strictly for informational purposes." The DNI has also created an information resource just like Wikipedia for agents to share information. They won't shut Fieger UP, waste of resources. Attorney Geoffrey Fieger used "straw donors" to illegally funnel $127,000 to the presidential campaign of John Edwards in 2003 and 2004, a 10-count indictment alleges. Fieger and his law partner, Vernon Johnson, 45, were named in the grand jury indictment that was unsealed Friday in Detroit. Fieger, 56, best known for defending assisted-suicide advocate Jack Kevorkian, said the charges were politically motivated and "solely intended to intimidate Democratic supporters around the country." Fieger said U.S. Attorney General Alberto Gonzales is "embarked on an unprecedented campaign to turn the United States Justice Department into a political arm of the Republican Party." "Over 100 FBI agents raided my offices and the homes of my employees and their families," Fieger said in a statement released Friday afternoon. "This is more agents than were assigned to catch Osama bin Laden in Afghanistan at Tora Bora since that time. And for nearly two years, Gonzales' political agents have threatened and harassed my friends, family and employees," Fieger said. The 30-page indictment accuses Fieger and Johnson of conspiracy, illegal contributions, false statements, obstruction of justice and causing an offense. 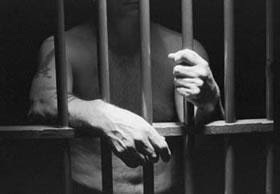 The indictment said Fieger was a fund-raiser for Edwards in 2003 and 2004. The justice department alleges Fieger and Johnson skirted the $2,000 individual contribution limit by soliciting others to make contributions to Edwards and either providing the funds or reimbursing the donors for their contributions. The donors included attorneys and spouses of Fieger's law firm, non-attorney employees and spouses at the law firm, Fieger's friends and third-party vendors to the law firm, according to the indictment. The indictment also alleges Fieger obstructed justice by concealing information or providing false information to the grand jury. The government alleges Fieger told federal agents a deceased member of the law firm was responsible for the campaign contributions. The grand jury began its investigation May 18, 2005, and issued 40 subpoenas later that year. Federal agents executed a search warrant at Fieger's law firm on Nov. 30. Fieger has been an outspoken supporter of Democrats and ran unsuccessfully for governor in 1998. He also has been a vocal critic of Michigan Attorney General Mike Cox. "The false charges made against me and my partner today will ultimately fail," Fieger's statement concluded. "It will be incumbent upon the American people to remove from office all those who participated in this political charade." Using 100 FBI agents suggests this is a Political case. My money is on Jeffery. Surprise coming for Internet Insurgents. I don't know if that's good or Bad, lol, we will take it. 2 nd out of 161. "Ok guys we did it, told you it was safe, no one saw us, nothing in the sky, and were here back at my apartment safe and sound those stupid Americans"
Then the apartment blows up, and they come out waving white flag? Say isn't a white flag al Qaeda's flag? Cartoon banned by 25 USA newspapers, umm no sorry "yellow rags"
use 'back key', to return. Any one have the list of these "yellow rags" doing their BRAVE part for freedom of speech? USA troops are dying for these cowards right NOT TO PRINT these cartoons . Glad to see these 'rags' are doing their part. TEHRAN (AFP) - The head of the Iranian central bank resigned on Sunday, the third departure of a key economic policymaker from President Mahmoud Ahmadinejad's administration in just two weeks. The resignation of Ebrahim Sheibani comes after the unexpected departures of the oil and industry ministers on August 12, a move that was widely seen as an attempt by Ahmadinejad to increase his control over the economy. It also coincided with the departure of one of Ahmadinejad's closest aides from a top interior ministry post and his replacement by a general who has a background in the elite Revolutionary Guards. "The resignation of Ebrahim Sheibani has been accepted by President Mahmoud Ahmadinejad," government spokesman Gholam Hossein Elham was quoted as saying by the official IRNA agency. He added that the government was seeking to appoint Tahmasb Mazaheri -- the economy minister under Ahmadinejad's reformist predecessor Mohammad Khatami -- as new central bank chief and the process was now in its "final stage". Recently Mahmoud Ahmadinejad, has made disastrous financial changes. Malawa Valley, pin marks place of Binnys caves. was not optimistic about getting timely permission. Whenever he and his men moved within five kilometers of the safe house, he says, they had to file a request form known as a 5-W, spelling out the who, what, when, where and why of the mission. Permission from headquarters took hours, and if shooting might be involved, it was often denied. To go beyond five kilometers required a CONOP (for "concept of operations") that was much more elaborate and required approval from two layers in the field, and finally the Joint Special Operations Task Force at Baghram air base near Kabul. To get into a fire fight, the permission of a three-star general was necessary. "That process could take days," Rice recalled to NEWSWEEK. He often typed forms while sitting on a 55-gallon drum his men had cut in half to make a toilet seat. "We'd be typing in 130-degree heat while we're crapping away with bacillary dysentery and sometimes the brass at Kandahar or Baghram would kick back and tell you the spelling was incorrect, that you weren't using the tab to delimit the form correctly." But Rice made his request anyway. Days passed with no word. The window closed; the target—whether Mullah Omar or not—moved on. Rice blames risk aversion in career officers, whose promotions require spotless ("zero defect") records—no mistakes, no bad luck, no "flaps." The cautious mind-set changed for a time after 9/11, but quickly settled back in. High-tech communication serves to clog, rather than speed the process. With worldwide satellite communications, high-level commanders back at the base or in Washington can second-guess even minor decisions. Special Operations Forces planned an airborne commando raid that could have been produced by Jerry Bruckheimer. Some 30 U.S. Navy SEALs were to be flown by C-130 transport planes, under cover of darkness, to a spot high above the Afghan side of the Pakistan border, about 30 to 40 miles away from the target. The SEALs would jump from the plane and use parasails—motorized hang gliders—to fly through the night sky, across the mountains, to a secret staging point close to the compound. 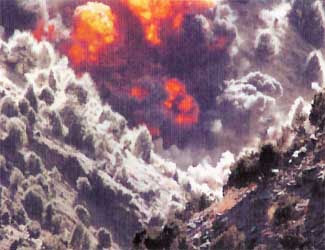 Things are much different now, major operation is under way in Malawa valley, below the Tora Bora Caves ole Biny used. 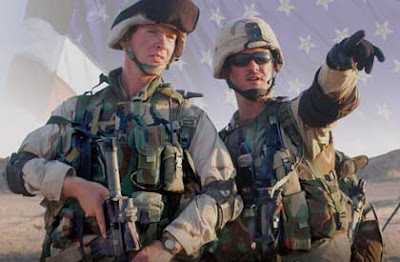 The Fight is going well, smoothed chain of command has relieved many of the problems listed above, tremendos resources have been alocated for this operation, the sudden discovery energized the Pentagon to provide extensive resources and apply lessons learned from the past. Hammer and anvil are in place, the terrorist are mostly hiding, moving only when needed at night, and trying to disguise themselves in day light. Most operations are Intel collections and search and destroy with over whelming force. A villager forced from his home in the area, Allah Dad, tells Wafa that the coalition ground and air operations have been incessant. "Planes are flying over during the night," Allah Dad says. "We can see the U.S. troops coming and going during the daylight hours." 82nd Airborne is the main thrust and Texas National Guard involved, Illinois Army National Guard also doing their share. Canadians involved also. 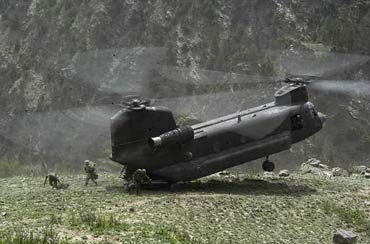 In January 2007, the Division Headquarters, 4th BCT (includes 1-508th and 2-508th) and the Aviation Brigade deployed to Afghanistan for Operation Enduring Freedom VIII. The 3rd BCT, 10th Mountain Division (Light Infantry) was extended for 120 days to increase the troop strength against the Taliban Spring Offensive. Supporting the Division are the 36th Engineer Brigade, and the 43rd Area Support Group. As the largest parachute force in the free world, the 82d Airborne Division is trained to deploy anywhere, at any time, to fight upon arrival and to win. From cook to computer operator, from infantryman or engineer, every soldier in the 82d is airborne qualified. Almost every piece of divisional combat equipment can be dropped by parachute onto the field of battle. Today, no other military unit can respond more rapidly and effectively to conflict anywhere in the world than the 82nd Airborne Division. Known as "America's Guard of Honor," the 82nd is widely recognized as one of the most powerful forces in America's military arsenal. The role of the airborne division is to plan, coordinate, and execute a rapid, combined arms, and forced entry operation employed alone or as part of a joint task force across the depth and width of the battlefield. The airborne division is unique in its ability to be deployed by parachute to achieve objectives. The high value targets they are looking for mean this will be a detailed, extensive search operation. Targets include al Qaeda and Taliban leaders. U.S. Special Operations Forces have had considerable practice by now chasing jihadists in Iraq and Afghanistan. The JSOC headquarters at Baghram is so full of high-tech listening and tracking equipment that it resembles "something out of 'Star Wars',"
The terrorist feel safe here, but they have walked into a trap, this time USA is watching the back door, and has everything in place for this mop up operation. "The operation has been going on at Tora Bora since [August 14]," Mir Dad tells Radio Free Afghanistan. "The [foreign] troops are coming and going, and the bombing has been severe. Expect other vicious attacks in Afghan in an attempt to draw off forces from Malawa valley operation. This will prove very interesting when the news black out is raised, only news embeds are with special forces, and they can't report till completion.